As an independently owned company for over 20 years, All About Closets has the ability to offer a truly custom experience. 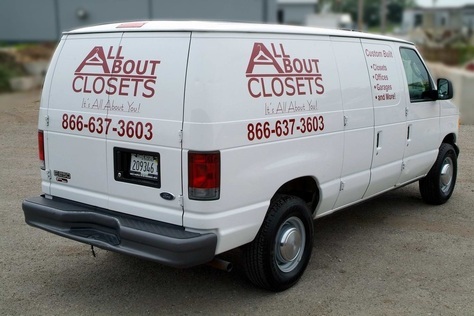 ​All About Closets custom manufactures products in our local manufacturing facility. This allows us to provide you with a high quality custom built system in a timely manner. Every step of the process is carefully managed to ensure closets and systems are built to last a lifetime. All organizational systems are built with the highest quality materials and are backed by a lifetime warranty. The main office and manufacturing facility are located in Romeoville, Illinois and designers are located throughout the Chicago and the Chicagoland suburbs. Our passion for closets began in the Boston area where the best skill and knowledge was taken from various organizations to define the high standards of service, products and quality that make up All About Closets. The team has over 20 years of experience in the design, manufacturing and installation of closet s and organizational systems. Each member is courteous, professional and highly trained in their area of expertise. All systems are custom manufactured in our state of the art facility giving you a truly custom experience. The All About Closets’ design team is the best in the industry. They are professionally trained to assist you in developing creative and functional space saving solutions that maximize your space and compliment your design style. We offer detailed 3-D color drawings of your closet or organizational system that offer a clear picture of what to expect. This detailed overview helps you to take out any guess work before the system is installed. We use the highest quality products to provide a beautiful and functional system to last, and all of our products are guaranteed for life. The installation team is a key part of our success. All About Closets staffs a full time installation team that is dedicated to providing you with an excellent customer experience . They are prompt, professional and have over 20 years of experience. Our staff enjoys what we do and it shows. You will feel our excitement and passion the minute you contact us. Our designers and installers will arrive prepared and promptly at a time that is convenient for you. We pride ourselves on delivering and installing your custom systems quickly with little disruption to your home. We will leave your home looking better than when we arrived.